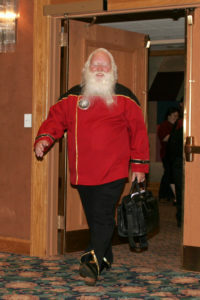 The PERFECT stocking stuffer for CHRISTMAS – and SANTA’S even a TREKKIE! You can rediscover the magic and wonder of Christmas in the pages of a touching and inspirational book…a book with my name on the cover! 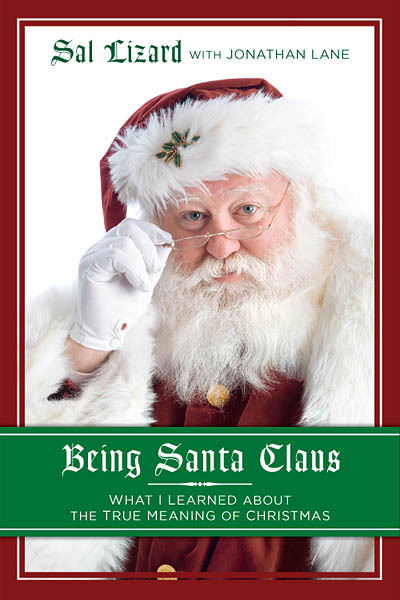 Being Santa Claus is a heartwarming collection of memoirs from one of the world’s most dedicated, professional real-bearded Santas, and it’s the perfect gift to get for someone you love. And I’m not just saying that because I co-wrote it! 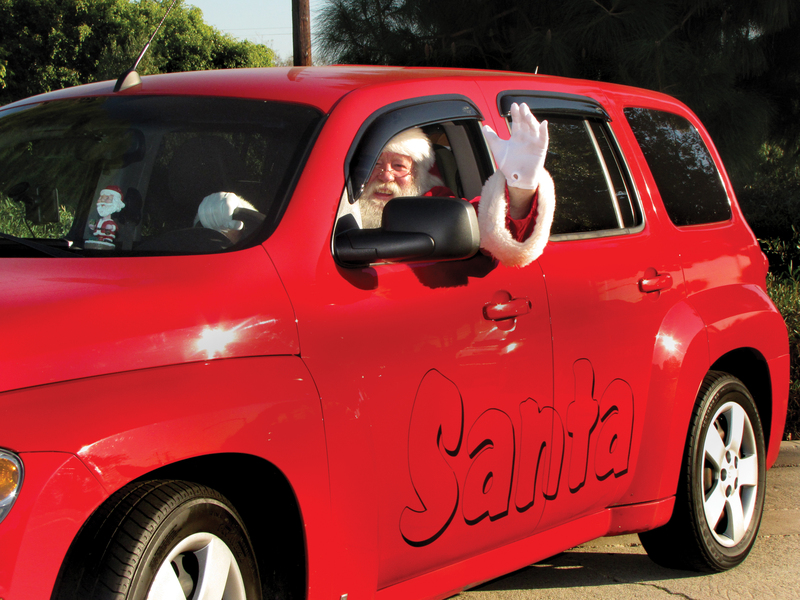 Santa Sal is truly one-of-a-kind, and in the pages of this book, you’ll learn why he is one of the most special and amazing Santa Clauses that you will ever read about. What does any of this have to do with Star Trek fan films? Nothing, really (except that Santa Sal does happen to be a huge Trekkie, which we mention in the acknowledgements at the end). But no, this isn’t a blog post about fan films. However, I hope you’ll indulge me with some holiday goodwill, because I’d like to tell you about my white-bearded friend and the wonderful book we wrote together. Sal Lizard first cast his spell on me back in 2008 when I signed up to be the Chief of Communications for STARFLEET, The International Star Trek Fan Association, Inc. At the time, Sal was serving a 3-year term as the Commander, STARFLEET (the president of a 5,000 member Trek fan organization that dates back to 1974) and he needed a person to take over publication of the club’s bi-monthly newsletter. Initially, I didn’t want to do it, but Sal talked me into it. Sal also has a beard that grows at warp speed. 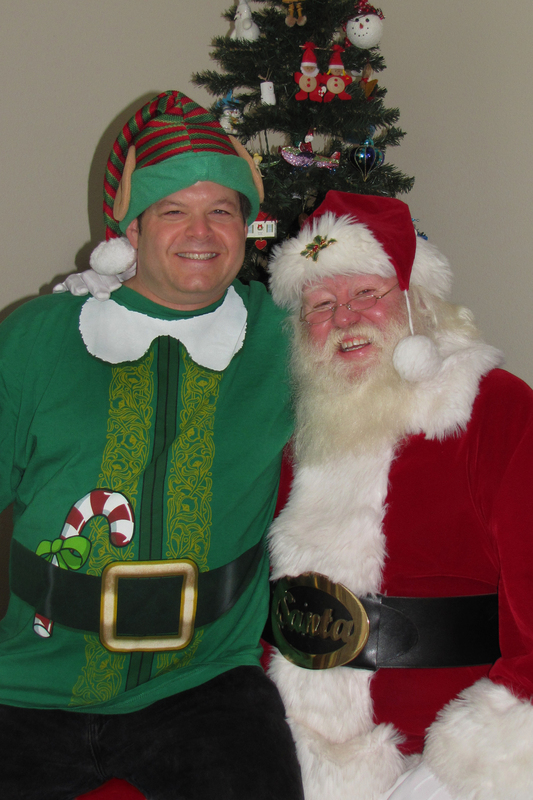 He jokes that if he shaves at 8:00 am, he’ll have a five o’clock shadow by 9:45 am! So pretty much since his mid-twenties, Sal has looked exactly like Santa Claus. But that didn’t mean he decided to put on a red suit right then and there. 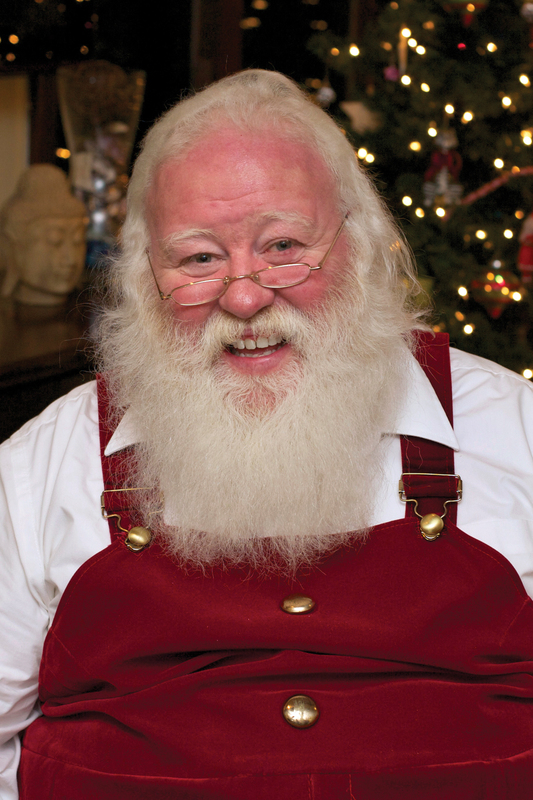 No, the fateful decision to become Santa Claus wouldn’t happen for another decade. I almost did a spit-take with my drink! I had to know the rest of this story (and you can, too, if you buy the book). And yes, it was hysterical. I asked if he had any other fun stories. 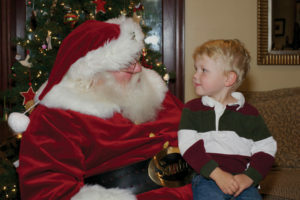 This began what must have been a two-hour conversation filled with dozens of Santa “encounters,” as he called them. I later found out from Sal that lots of people would tell him to write a book, and his typical answer like the one he’d given me tended to end the conversation right then and there. Sal was game. After all, what did he have to lose? Maybe a few hours on the phone telling stories…one of his favorite things to do anyway. We agreed to give it a go after getting back from the conference. I’d never written a book before. Well, that isn’t entirely true. I wrote Starship Spotter for Pocket Books back in 2001. But that was more like a four-week sprint with Alex Rosenzweig as we feverishly tried to fill in for a writer who’d flaked after having turned in nothing usable for five months on the project. 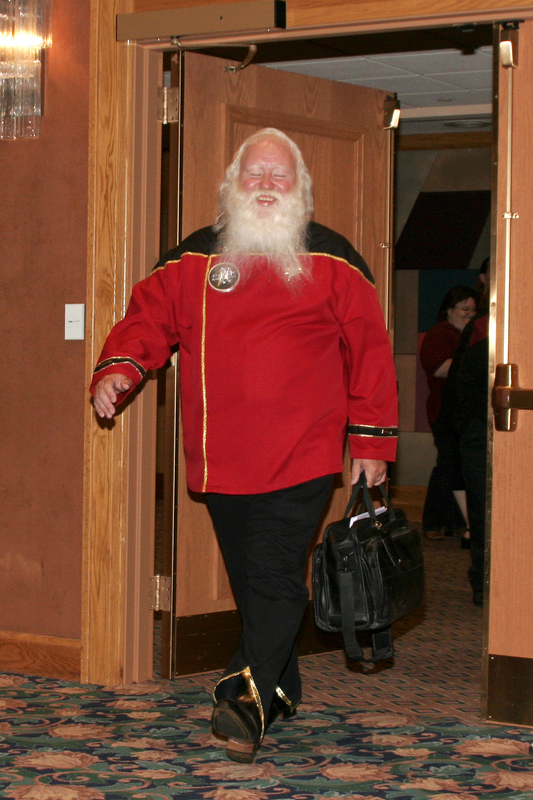 So yeah, Starship Spotter was a book, a Star Trek reference book, but this Santa Claus book was going to be more like a novel-length memoir. And instead of just writing about staships in a fictional universe, this book would be about real people in the real world. But I was ready! Sal and I had a few calls, and I quickly managed to type up drafts for the first three chapters. Eager for some feedback, I e-mailed a PDF to my mother. Mom has taught reading and English to kids for more than 50 years, and I figured she’d make a great editor. And of course, she’d obviously LOVE my stuff because, heck, she’s my mom, right? She didn’t love it. And when your doting mother who puts her son up on a pedestal doesn’t love what he wrote, well, you know you wrote crap! Fortunately, Mom provided better feedback than just that…very valuable and insightful feedback. In fact, what she told me changed the entire way I approached this project. Mom said that, as she read the chapters, she didn’t feel that she knew who Sal was, what he was thinking, or why he was doing what he did. It almost seemed as though life was happening TO him, but he wasn’t really doing much more than going along with it. Hmmmm, that certainly wasn’t what I was going for! But then I realized what had gone wrong. There’s a difference between telling someone a story over drinks at a bar and the experience of reading an actual book. Readers want descriptions of people and places, dialog, and most of all, insights into the main character or characters through the sharing of thoughts and feelings. I had simply been talking the casual conversations we’d had and typing them up, and that was waaaaay too easy. I was going to need to do a LOT more work…and so was Sal. We proceeded to tackle those three chapters again, this time drilling much deeper into details both external to the scenes and internal to Sal’s own mind. And much to my delight, Sal has an amazing memory! Most of all, I organized Sal’s recollections into carefully structured storytelling that packed an emotional punch. Usually, these were funny and happy stories, exciting and triumphant. A few were almost slapstick comedies of errors from Sal’s early days in the red suit when he hadn’t quite mastered the art of being Santa Claus yet. There were secrets that only professional Santa’s know, interesting tidbits like what does Santa do when a kid pees on his lap or how to keep yourself from stinking after sweating for ten straight hours inside a hot, velvet Santa suit wearing gloves and a hat, as well! Occasionally stories of frustration or hardship would work their way into the book, as not everything went smoothly all the time for Sal (and how he deals with adversity is one of the true defining character traits for him as a person). But I will never forget the day my mother called me up to say, “You made your father cry. He just finished the chapter about Timothy.” My dad doesn’t cry. In my entire life, I’d only seen him cry once, and that was at the funeral of my grandfather. That said, please don’t think the book is a downer! It’s full of Christmas cheer, holiday magic, and the joy of innocence that can only come from children and those who are young at heart. If you find yourself crying (other than during the Timothy chapter), they will surely be tears of joy. My son Jayden was born while Sal and I were still working on the book. 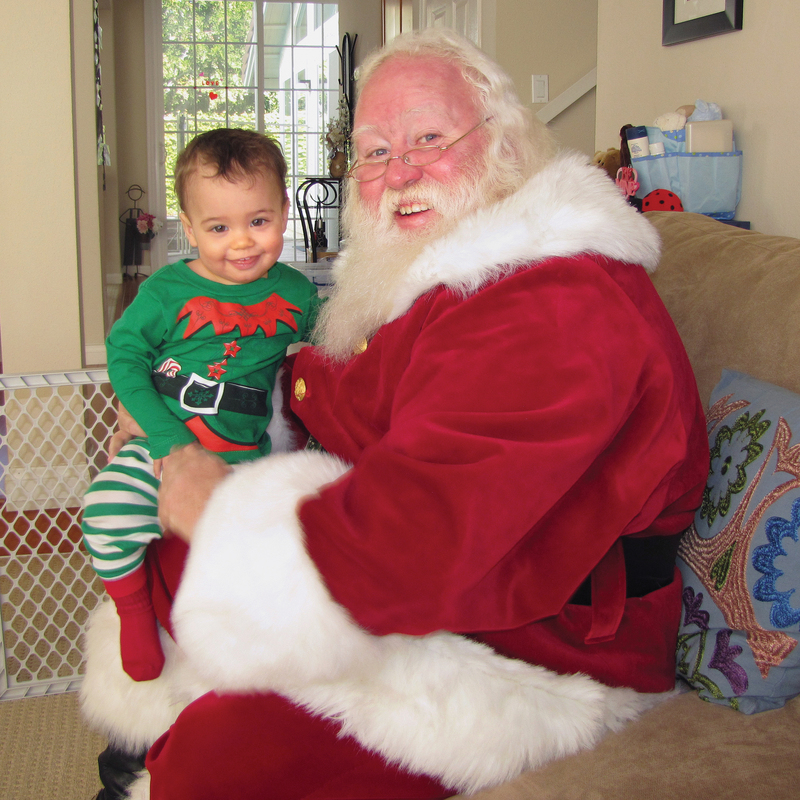 A year later, Sal came to visit us in California, and Jayden now has a photo of Santa Claus sitting in our house! The agent read our manuscript over the Fourth of July weekend and called me Tuesday morning offering to represent us. (Gee, that was easy! I thought.) Two weeks later, after a short bidding war, our agent had managed to sell the U.S. publishing rights for our manuscript to Gotham Books, a division of Penguin Publishing, for a somewhat jaw-dropping advance (well, jaw-dropping for Sal and me). 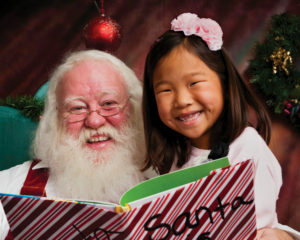 Our book, Being Santa Claus, was first published in November of 2012, and it got some hoopla. 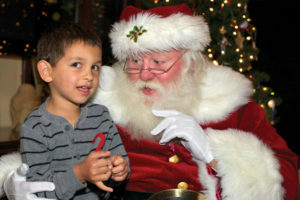 Santa Sal even appeared on The TODAY Show with Matt Lauer. Now, however, it’s four years later, and the book is mostly out of print. But you can still get it on Amazon for a very attractive bargain price. Please note that I’m not hocking the book to line my or Sal’s pockets. Now that the book is out of print, we don’t get any royalties anymore. I’m just trying to spread the holiday spirit because there seems to be precious little of it these days…and I think we all need a little Christmas now more than ever! Hopefully, this book will help you and/or someone you love capture just a little extra bit of that Santa Claus magic. 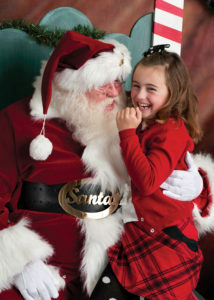 Here’s a direct link to BEING SANTA CLAUS on Amazon.com. Jonathan Lane and Santa Sal say MERRY CHRISTMAS TO ALL! You are right, the book can be had for as little as $2.49 + $3.99 shipping. But I looked at all options, and incredibly the highest price is nearly $800.00 Here is a screenshot to back that up. There are still some new books at reasonable prices though. But I was astounded at the later ones! And only 40 books left BTW. Previous Previous post: STARSHIP VALIANT releases its second episode “CROSSES TO BEAR”! 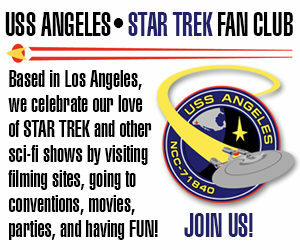 Next Next post: The HISTORY of STAR TREK FAN FILMS…in PDF format!